When I read Take the Fall, I fell for Jase and Piper based on the chapter included as a teaser at the end of the book. I loved the idea of this tattooed-ex-con-bad-boy with a soft spot for the good girl. I loved the idea of a woman spreading her wings, not only by shedding her parents' expectations for her life and making some of her own, but by going after the guy she's loved forever. When We Fall did deliver on those things. Jase's super protective of Piper, who is determined to make a new life for herself, without her parents' help. The odds are a little stacked against her as she's not got a lot in the way of finances, she needs a place to live right at the very start of the book, and she has a medical condition that complicates everything. Plus a ton of family baggage. Oh the baggage. What the book excels at is communicating both the attraction between Jase and Piper, and amping the sexual tension between them. The book has plenty of steamy scenes. There's also a surprising number of emotional ones as they both deal with the past and making sense of the future. I did find a bit of character inconsistency with one of the secondary characters. There was one scene that really threw me off, and had me scratching my head. Otherwise, I was a little let down by how quickly Jase and Piper wind up together. I appreciated Jase's resistance to the idea early on, and I wanted to see that struggle extend through more of the book. I never really felt like there was a serious threat to the HEA for this romance, and that made some of the book a little flat for me. Still, Jase and Piper are, individually, characters that I really liked, and I did enjoy this book. 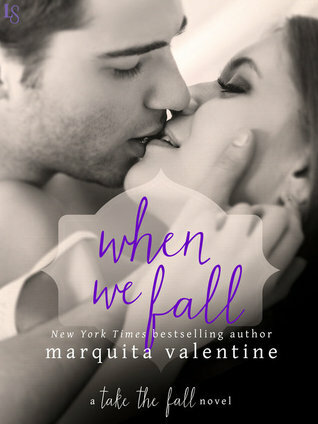 When We Fall is a solid contemporary romance between a "bad boy" and a "good girl." It met my expectations in some important ways, and it fell a little short in others. Still, I'd recommend it (particularly at the current price point of 99 cents) if you're at all intrigued by the blurb or if you read the first book in the series! I am not a huge fan of Contemporary Romance (I seriously have to be in just the right mood for it) but I will put this on my list for when I am in the mood.